Volcarona, The Sun Pokémon. As it flies, it scatters its flaming scales. It was feared by ancient people, who referred to it as “the rage of the sun.” According to legends, it was hatched from a flaming cocoon to save people and Pokémon that were suffering from the cold. High Special Attack - Few threats wants to sponge hits from Volcarona's base 135 Special Attack, even without the boost of Quiver Dance. This allows Volcarona to pressure out threats and create space to set up Quiver Dance and aim to sweep the enemies team. Volcarona also makes decent use of choiced items with nice surprise value, but there's usually other Pokemon that use them better. Quiver Dance - Quiver Dance is the real thing that makes Volcarona a powerful threat. Being the second best general boosting move, this allows Volcarona to pressure teams with a single boost. Z-Moves - While most Pokemon generally get better with the advent of Z-Moves, Volcarona has an insanely diverse movepool that lets it lure a wide range of threats with Grassium Z Solar Beam, Psychium Z Psychic, or even Normalium Z Hyper Beam. Coverage - Volcarona has shaky coverage overall, being unable to cover everything it wants in three moves. It struggles with common type combinations such as Dragon/Flying and basically anything Fire if not going the Z-Hyper Beam route. The biggest problem for Volcarona is Heatran though, which walls both STABs and makes Volcarona pick between Hidden Power to determine if it can even hit Heatran. Low Stats - Now I did say that Volcarona has good stats, which it does in specific areas. 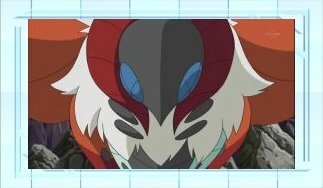 However, 60 Defense is really bad and means Volcarona has to burn physical attackers to hope to boost on them safely, or invest heavily in bulk. However, this means that Volcarona is easy to revenge kill with common threats such as Garchomp and Salamence. This feeds into Volcarona's Speed. Volcarona came out with strong Speed, at a point where base 100 was the benchmark. However, speed tiers keep creeping up and Volcarona isn't getting any faster, making it more reliant on boosting to outspeed foes. Flame Body - 30% chance to burn on contact - The better ability for Volcarona as it helps with Volcarona's low base defense with a random burn, or otherwise give a parting gift to its foe as it gets KOed by contact moves. Swarm - Boosts Bug type moves by 50% when at or below 33% health - A niche option that has some use in specific sets, namely with Buginium Z and Substitute. Volcarona's bread and butter set. Quiver Dance is the key move, boosting up Volcarona's key stats, Special Attack and Speed, allowing it to sweep. Fire Blast is the primary move of the set with very high power and overall good type. Bug Buzz is second to prevent Volcarona from being walled by Tyranitar and punishing Latios on the switch. Last slot is open to Hidden Power Ground to beat Heatran, or Psychic to not be walled by Keldeo. Psychium Z should be used if you run Psychic as it allows massive damage to Toxapex and even Heatran, while Buginium Z is a more general option for nuking power. With Substitute to sponge up hits, Volcarona can just Quiver Dance without much fear outside of revenge killers such as Choice Scarf Latios. Consistently breaking the Substitute also pushes Volcarona into the range of Swarm, making Bug Buzz and its Z-Move Savage Spin Out, hit for some insane numbers. Fire Blast is the final move just for powerful STAB. This set demands a bit more team support however. due to its limited coverage. Fiery Dance - More PP, better accuracy, chance to boost Special Attack, less power. This will miss some OHKOes but the accuracy and RNG can be worth based on your team and style. Normalium Z - With Hyper Beam, Volcarona can destroy unsuspecting foes expecting to wall its usual coverage moves. This tends to be most effective in a 3v3 setting where the coverage slot is easier to afford. 50% Berries - Volcarona can opt to invest heavily in bulk and use a 50% berry such as Wiki Berry, in order to handle physical attacks better. This is mostly valuable in a Battle Spot setting, where being able to comfortably tank Mimikyu's unique Z-Move is much more valuable. Hazard Control - With quad weakness to Stealth Rock, hazard control is needed. Defoggers such as Latios and Zapdos are good offensively as they maintain momentum and pressure Volcarona's checks, especially opposing Latios. Rapid Spinners such as Starmie and Excadrill are also good options, especially Starmie for its high Speed and coverage. while Excadrill scares away other threats such as Tyranitar, and with an Assault Vest, opposing Latios. Gyarados - With Volcarona's weakness to Keldeo and Heatran, as well as struggling with Garchomp, Zygarde, and Landorus Therian, Gyarados is a nice offensive partner. Not only can Gyarados boost on most of these threats, namely Keldeo, Heatran, and non Swords Dance Garchomp, its Mega sets pressure a wide range of threats with its stall breaking nature. It also baits in threats such as Tapu Fini, which Volcarona can sometimes boost on. Garchomp - Heatran is a major problem, so Garchomp is a nice answer as it can easily scare off Heatran with Earthquake, while setting up hazards or applying pressure with Swords Dance. Garchomp also baits threats such as Celesteela and Tapu Fini that Volcarona can boost on. Volcarona is a Pokemon that always manages to find a way to work in Doubles, despite having so many traits working against it. Bug/Fire is not a great typing in general for Doubles, and Volcarona's awful physical bulk doesn't help that. However, access to Quiver Dance, Tailwind, and even Rage Powder gives Volcarona many unique tools to stand out as an offensive support Pokemon. 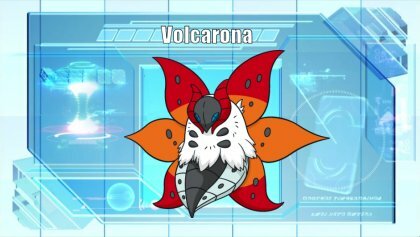 Times have gotten tough for Volcarona with the rise of Incineroar, and the likes of Tapu Fini, Landorus Therian, and Charizard being so common doesn't help. However, with its powerful Special Attack and a solid STAB spread move in Heat Wave, Volcarona has enough to ensure it's a threat. 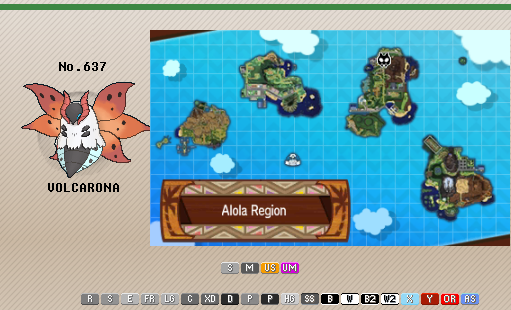 Not much has changed for Volcarona and the environment around it doesn't do it many favors, but it still manages to pull off more or less the same sets as always. 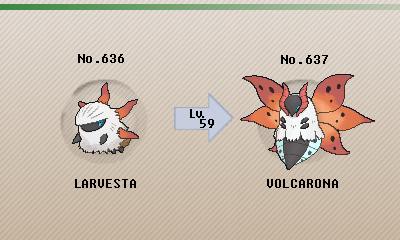 Volcarona is a fairly straightforward special attacker with solid sweeping potential. Heat Wave is the standard Fire-type STAB, hitting both foes for solid damage and functioning as a primary sweeping tool. Giga Drain grants the best coverage alongside Heat Wave, giving it a way to hit Tapu Fini and Tyranitar while also healing back some of the damage it takes. Bug Buzz doesn't help against Tapu Fini, but it provides a strong single-target STAB move that hits Incineroar neutrally. Quiver Dance is a mandatory setup move here, making it a special powerhouse that can outpace a wide range of threats after a single boost. And as always, Protect is the standard defensive tool in Doubles, which is especially useful on a sweeper that draws attention towards itself after setting it. Flame Body allows Volcarona to punish physical attackers that pick at its weaker physical bulk, especially Fake Out users not named Incineroar. The given EV spread allows Volcarona to outspeed Adamant Choice Scarf Landorus-T after a Quiver Dance boost, while giving it as much bulk as possible. In combination with a Wiki Berry, this gives Volcarona as many opportunities as possible to set up despite its shaky physical bulk. A Modest nature is chosen for the biggest overall increase in power, even without heavy investment. If Wide Guard and spread reduction annoy you too much, Firium Z can serve as a viable alternative to function as a nuke against Steel-types that can take an unboosted Heat Wave. - A Choice Scarf set with other coverage moves like Hidden Power Ice and Overheat can be just as effective as Quiver Dance sets, though this gives up flexibility that Volcarona normally likes to have. - A support set with Tailwind and Rage Powder can make use of its unique defensive traits while also still packing a punch. While this suffers from some awkward weaknesses, Bug/Fire still offers some unique resistances with Flame Body to punish physical attackers expecting to push Volcarona aside. - Focus Sash is an unexpected alternative to the berries or Z-Moves if you find the team has trouble supporting Volcarona defensively, though the flexibility of berry slots generally lean towards another berry being a better filler item. Fast Scarf Users - With 100 base Speed Volcarona loses to any Choice Scarf users that have higher base Speed than 101. This includes Latios, Greninja, Garchomp, and Keldeo, though it also ties with a huge range of threats such as Salamence. Heatran - Heatran is one of the best answers to Volcarona, forcing it to run Hidden Power Ground to reliably beat it. With Flash Fire, Bug Buzz is quad resisted, meaning Volcarona has a hard time muscling through, while Heatran can just Roar or set up Stealth Rock to threaten Volcarona. Keldeo - Resisting both of Volcarona's STAB moves as well as having a base Speed of 108, Keldeo can outpace Volcarona at base, as well as with a Choice Scarf after a Quiver Dance. Meanwhile, Volcarona struggles to OHKO Keldeo at full health unless it has Psychic.